Have you heard that WordPress is the most popular CMS in the World? Most likely! And you can find plenty of free WordPress themes for your needs for sure crafted specially for it. Today we will tell you about Top 10 Free Auto WordPress Themes, themes that are most wanted and downloaded among the WordPress bloggers. This theme has been released many years ago and it keeps on top of popularity. It has been downloaded over 45 thousand times and has a really high rating. Why? Well, it is quite simple if you open demo of this theme. It is has amazing combination of dark gray background with texture and straight details that symbolize dynamics and speed. 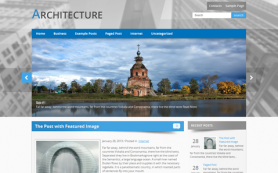 Exactly what people expect from the auto theme for web site. 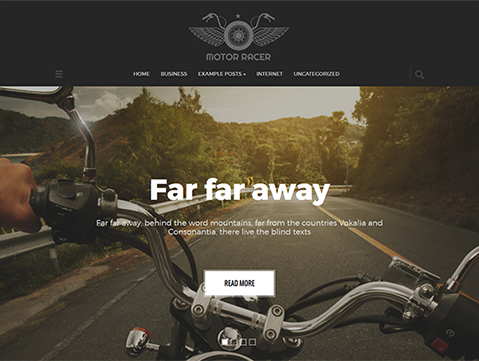 This leading auto free WordPress theme has taken a place in this list since people love it and love building their blogs and sites with the use of it. Yes, it is unusual and extraordinary. 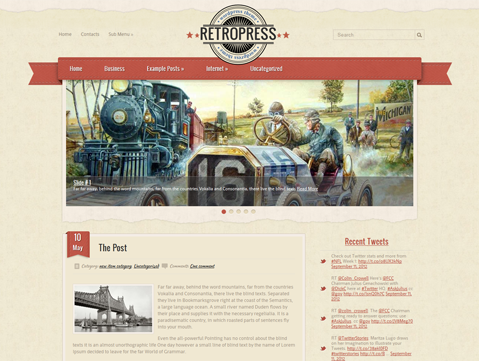 Its retro design stands out and suits for different types of sites. Actually, it may be even used for reastaurant website as well as for online gallery of your own private car collection. And this theme is also high rated ( 4.8 stars from 5 ) by those who have already tried it. 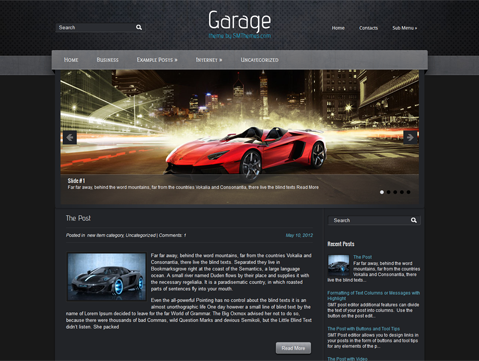 The CarSpawn theme is launched on the latest framework version 3.0 from SMThemes. It can boast of vertical main menu that grabs visitors attention at first glance and doesn't give them a chance to be misled since here they can find the main pages of your site. Full width slider at the background and large titles help readers better navigate and find the information you present. Excellent choice for blog or company website alike. 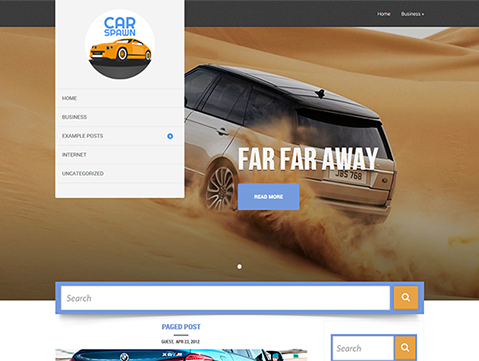 This free auto WordPress theme has been realeased by WPWOW.com and has won the hearts of car lovers with its purple design and elements that are created with the effect of gloss. All that adds a special charming atmosphere and elegance to the website where the theme is installed. Moreover, this theme is WooCommerce compatible and that means that you can easily create a nice looking online store with the use of the free FeelSpeed theme. Very lovely theme. 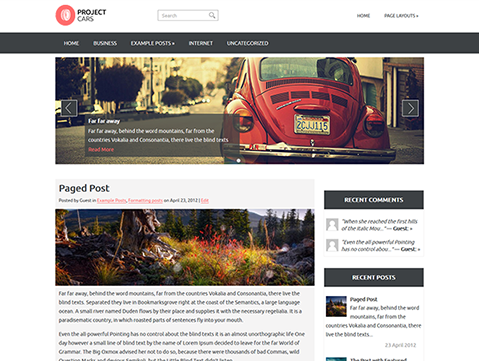 This extremely elegant free auto WordPress theme has attracted our attention as well as thousands of others. Probably, its design has something outstanding - have a look. Grey and yellow colors are put into the base of the theme. 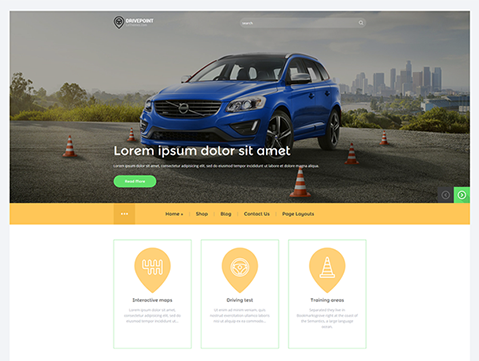 Pretty clean design сombines all that is needed and nothing more at the same time although the core of the theme is enough powerfull and allows you to choose one-, two- or three-column layout for your pages. For sure, the list of theme options is much wider and you can read it on the themes page here by yourself. And I would better move on to the next theme in our list. 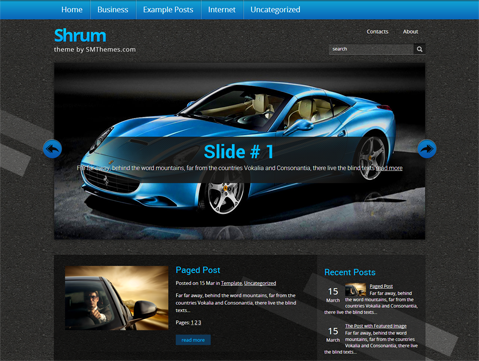 Magnificent free auto theme for WordPress website is all about DrivePoint by LeThemes.com. 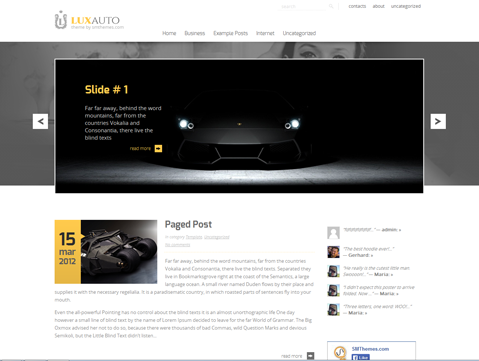 This a perfect theme for auto service, car dealers or simply local car oriented blog. Modern flat design, bright color scheme, showroom option for demonstration of your key options / services and the best feature - WooCommerce support along with special styles integrated and you can even look them on demo. Professional work of LeThemes developers gave super results. Our congratulations! The 7th theme we want to tell you today is Shrum. It goes without saying that planning, creating a strategy and finding your own design for web site takes sometimes more time that it has been expected. 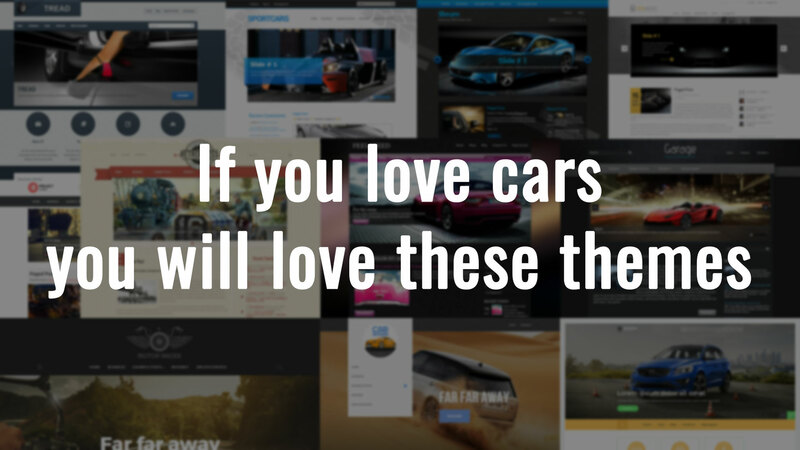 Or you may just rely on the choice of the majority and use this theme that is quite simple if your site is aimed for car business. Asphalt and semi-transparent background for content are at your services. Besides, the theme has built in Contact Form and many other options for corporate website. One more theme from LeThemes has taken place in this list since it confirms its popularity over the years again and again. Very firm design and front-end customizer won’t leave you indifferent. 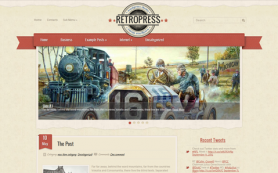 The theme offers you wide variety of fonts, layout options and other handy tools packed in. 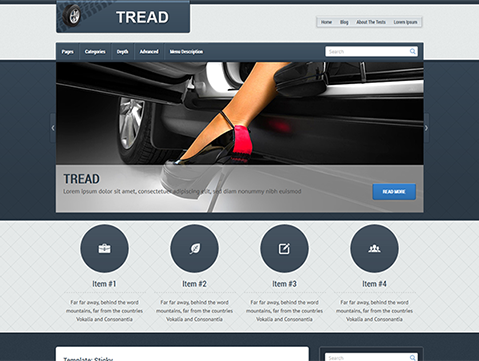 Lots of people avaluated an opportunity to download the theme for their website for free and already built websites with the use of Tread. 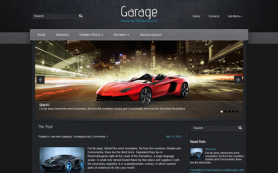 One of the best auto WordPress themes for those who love drive and probably active sport. Grey with orange are perfectly suitable colors for any racing club site or car expert blog. Easy video inegration and ready shortcodes for extra formatting will delight any writter - wether you are professional blogger or just started your business and decided to begin with a company website. Very clean and simple design, which is loved by many web designers exactly for these features. Nothing can distract you or your visitors from the foundation stone of your website - the information that is clearly presented and nice readable. Contact form is at your service. What else can stop you from choosing this theme for your purpose? I guess, only 9 themes that are listed before can actually stand on a par. We much appreciate you for visiting our blog and reading this article. We are happy to keep you up to date! 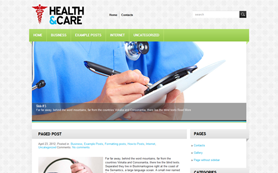 Amazing auto WordPress themes absolute for blog. Thanks for sharing! Hey SMThemes, great collection of themes. I am planning to do a minisite design and one of these would be perfect. Thanks for listing them here. Love your guys work!